Marine Corps General Alexander A. Vandegrift was born on 13 March 1887, in Charlottesville, Virginia. He attended the University of Virginia and was commissioned a Second Lieutenant in the Marine Corps in 1909. In 1912, Vandegrift participated in the capture of Coyotepe, Nicaragua, and two years later in the occupation of Veracruz, Mexico. He also served aboard the USS MINNESOTA, USS VIRGINIA, USS DELAWARE and USS CHESTER until ordered to Haiti in 1915 for action against the Cacos Bandits. For service in Haiti, where he continued to serve in various capacities until 1923, the President of the Republic of Haiti awarded him their Distinguished Service Medal and the Haitian Medaille Militaire with one Silver Star. The following 18 years were spent in various posts and stations in the United States, with the exception of two tours in China. In 1942, Vandegrift sailed to the South Pacific as Commanding General of the 1st Marine Division and led his men in the initial landing of the U.S. forces against the Japanese at Guadalcanal. For his actions, he was awarded the Navy Cross and the Medal of Honor. With the successful conclusion of the Solomon Islands campaign, Vandegrift assumed command of the 1st Marine Amphibious Corps in July, 1943, and directed the initial landing at Empress Augusta Bay, Bougainville. On 1 January 1945, Vandegrift was appointed to the rank of General, the first active-duty Marine officer to reach four-star rank. He then served as Commandant of the Marine Corps, and in this position guided the Corps' post-war reorganization and demobilization. General Vandegrift retired from active duty in April 1949. USS VANDEGRIFT, named for Gen. Alexander A. Vandegrift, U.S. Marine Corps, was built at Todd Pacific Shipyards in Seattle, Washington, and was commissioned on 24 November 1984. The ship's inaugural cruise began on 5 January 1987. During the course of this around-the-world cruise, it sailed three oceans, seven seas and visited four continents. The plankowners also crossed the international dateline, equator, Greenwich meridian, and sailed through the straits of Gibraltar, and the Suez and Panama canals. VANDEGRIFT conducted operations with USS KITTY HAWK (CV 63) in the Arabian Sea and Indian Ocean. These operations were highlighted by an air and sea power demonstration for the President of Pakistan. Port visits included Pearl Harbor; Subic Bay in the Republic of the Philippines; Karachi, Pakistan; Mombasa, Kenya; Maxime, France; Roosevelt Roads, Puerto Rico; and St. Croix and St. Thomas, U.S. Virgin Islands. VANDEGRIFT returned home to Long Beach in June, 1987. On April 22, 1992, VANDEGRIFT began its fourth deployment to the Arabian Gulf. VANDEGRIFT participated in exercises with India, Qatar and Pakistan, helping to strenghten U.S. relations in that area. 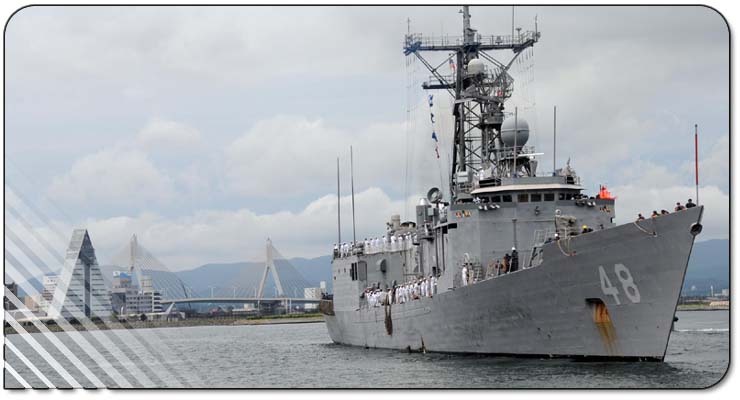 Ports of call included Doha, Qatar; Dubai, Jebel Ali and Abu Dhabi, United Arab Emirates; Karachi, Pakistan; Phuket, Thailand; Goa, India; Bahrain; Hong Kong; Singapore and Guam, and earned the Chief of Naval Operations LAMPS Helicopter Safety Award. VANDEGRIFT returned home on 22 October 1992. VANDEGRIFT changed homeport to San Diego in February, 1993, and earned the COMNAVSURFPAC Food Service Award in March, 1994. The fifth deployment to the Arabian Gulf began on 25 October 1994. VANDEGRIFT's mission was the enforcement of U.N. sanctions against Iraq in the Northern Arabian Gulf. The most memorable event was conducting a non-permissive boarding of a sanctions violator on Christmas Day. During the return transit, VANDEGRIFT played host to a major diplomatic reception in Muscat, Oman, to better diplomatic relations. Ports of call included Sasebo, Japan; Manila, Republic of the Philippines; Jebel Ali, United Arab Emirates; Bahrain; Singapore and Hong Kong. VANDEGRIFT returned home on 25 April 1995. The Shield: On a field of gold and blue, the colors traditionally associated with the Navy, a scarlet demi-lion symbolizing the Marine courage and strength holds a blue lozenge, emblem of the 1st Marine Division, which fought under General Vandegrift's command against the Japanese at Guadalcanal in the Solomon Islands. The four gold sectors of the shield represent the continents where General Vandegrift served during the greater part of his outstanding career, North and South America, Asia and Australia. The blue sectors represent the oceans and the Navy, also alluded to by the wavy diagonals. 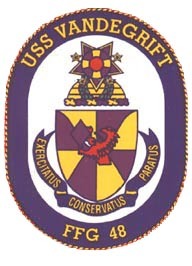 The Crest: General Vandegrift's medals and decorations are represented in the crest: the Medal of Honor, the Navy Cross and the distinguished Service Medal, the last referred to by the blue around the cross. The five bronze stars awarded to the General are recalled by the points of the Medal of Honor, and his distinction as the first active-duty Marine officer to reach four-star rank is symbolized by the four stars surrounding the crest. The adversary, Japan, against which General Vandegrift distinguished himself in combat, is alluded to by the red roundle at the center of the crest. The color red and the gold demi-globe also represent the Marine Corps. The laurel wreath symbolizes the many other awards and decorations General Vandegrift earned throughout his career, as well as his academic achievements and degrees.